Last time, ThreatTrack found malware after clicking on ads on the search page that comes up when you type in the query “youtube.” The company noted, however, that the scammers could of course be targeting other keywords; we agreed – the more popular the keywords, the bigger the potential for infection. 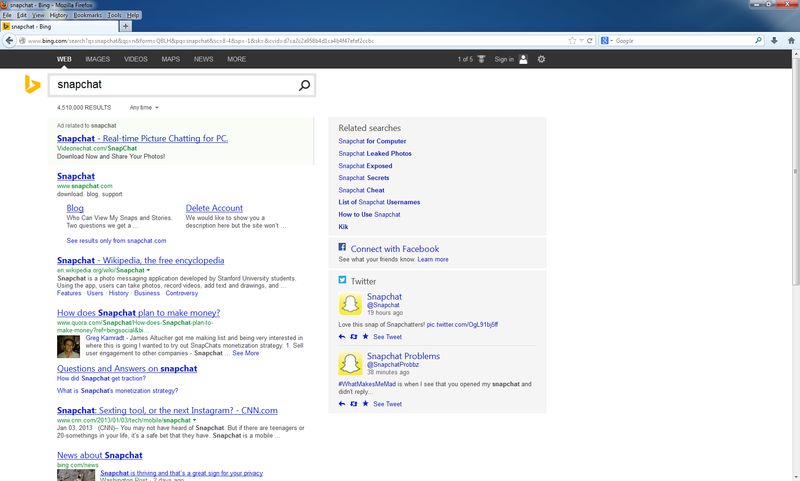 We have confirmed this ad comes up for us as well when we query Bing. The website the ad links to is quite dodgy: it talks about installing Snapchat, while also listing the program as “Dorgem” in small letters. The install offers up a number of ad serving programs, media players and additional software offered up with no relation to Snapchat whatsoever. During testing, we saw Realplayer, GreatArcadeHits, Optimizer Pro, Scorpion Saver and Word Overview. Legitimate programs being bundled with Adware is a common enough tactic, but this is an Optimum Installer bundle where a website serves as clickbait for a deliberately misrepresented app – you most definitely do not get what you’re promised in return for installing numerous pieces of ad-serving software. For the record, Snapchat is only available for Android and iOS. In general, please make a point to install apps from official sources such as Google Play and Apple’s App Store.